Posted on November 24, 2017 at 3:37 am. If it heats water, it creates scale. Call it calcification, lime scale…whatever you want but for home espresso and coffee makers it’s the stuff that clogs-up boilers and leads to poor performance and eventual machine failure. But, it’s super easy to prevent any problems with a little preventative maintenance. Like changing the oil in your car, a regular descaling or decalcifying ensures a long service life for your machine. The build-up of minerals inside the hot parts of your coffee machine or espresso machine is commonly called lime scale. This term is derived from hard water areas in some parts of the world that have a high lime content in their water. In fact any mineral that comes out of solution from heat can deposit itself in the water carrying parts of your coffee machine. Typically this will affect your boiler, the pumps and any parts that carry hot water. Usually the areas where the water sits still for a while, such as the boiler are worst affected. The build-up of lime scale will slow the water flow, reduce your boiler capacity and if left will eventually prevent your coffee machine working. Some boilers can end up with so much scale that they have heating problems. How Often Should I Descale? The time intervals between descaling depends upon many factors. The two main factors are the quality of your water and the amount of water running through the machine. I speak to people using bore water pumped straight from the ground who need to descale their coffee machine monthly. In some cities, in conjunction with a water filter you can use your coffee machine for a year or more without descaling. Try to find a water hardness test kit that will tell you how hard your water is. Your kettle is also a good indicator, if lime scale builds up in your kettle, you can count on it being in your coffee machine. If you use less water by drinking espressos you’ll need to descale less often than if you make cappuccinos! How Do I Descale My Coffee Machine? Firstly, read the instructions that came with your coffee machine or espresso machine, if they disagree with this article then follow the instructions that you have. You don’t want to void your warranty! I recommend using a proper citric acid based descaling solution designed for espresso machines. This should be mixed and prepared as per the instructions on the bottle or packet. Definitely DON’T use vinegar, it’s not good for your espresso machine. You need to descale your coffee machine while it’s cold. Put the prepared descaling solution into the water reservoir, turn on the machine and pump water (not steam) through the steam nozzle for about 20 seconds. If your espresso machine doesn’t have the facility to pump water this way then pump it through the group handle without the handle in place. Immediately turn off the machine. 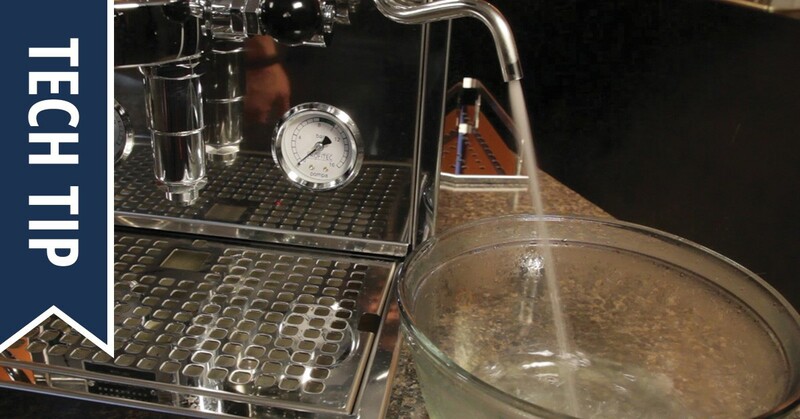 Your espresso machine is now cold with the descaling solution inside the water components. The limescale will be dissolving while you wait. After about 10 minutes turn the machine on again and pump more water through for about 1 minute. Turn the coffee machine off again and wait for the descaling solution to do its work. While you’re waiting for the descaling solution to eat away at the limescale build up, take the opportunity to clean other parts of your coffee machine. Pull apart your group handle and clean it out. Get all the burnt milk off the steam spout and wipe the outside of the machine. Keep repeating the steps above until the water reservoir is empty. All the solution should have been pumped through the machine and the limescale will have been removed. This should take about 5 cycles and about 1 hour. You now need to clean the bitter tasting descaler from your espresso machine. Thoroughly rinse the water container in your machine and fill it with fresh clean water. Run the entire container through your machine. Repeat this process again and your coffee machine or espresso machine is now descaled!! Make at least one coffee and throw it out to make sure all the descaling solution is gone. Now that you’ve got a sparkling clean coffee machine treat yourself to a great cup of coffee!